Gavin Kennedy can’t stand the idea that a left-wing thinker might read Adam Smith’s Wealth of Nations and use that reading against neoliberal misappropriations of Smith. The left-wing thinker at issue is Noam Chomsky (of MIT, not Harvard), who claimed quite rightly that Smith both extolled the division of labor (because it led to a higher productivity, and thus more national wealth) and condemned its effects on the individual worker (who, in Smith’s words, “generally becomes as stupid and ignorant as it is possible for a human creature to become”). The latter served as the basis of Smith’s calling for public funding for education. What is it that Chomsy (or, in a follow-up, J. Young) get wrong? Neither argues against the technical division of labor (although there’s much that can be and should be criticized) or that the government can or should abolish it (even though there’s nothing “natural” about the division of labor). They make a rather simple point: neoclassical economists and neoliberal thinkers invoke Smith to justify laissez-faire capitalism but none of them matches Smith in at least acknowledging the degrading effects of the capitalist division of labor. They are the ones who should be accused of not reading Smith’s Wealth of Nations, not Chomsky or Young. They are the ones who want to “starve the beast” and undermine public support for social programs, including public education, in stark contrast to Smith’s own views on the topic. But, apparently, Kennedy can’t be bothered to make an ado about something so important. I am indifferent to the political affiliations of anybody who makes assertions about Adam Smith’s ideas or the meanings of what he wrote in his Works. These affiliations are not relevant. I am a student of Adam Smith, not an ideologue. I ‘can’t stand’ left- or right-wing thinkers who invent false ideas and myths which besmirches Adam Smith’s Legacy. Mostly agreed but it wasn’t the ‘effects of the division of labour’ that condemned the workers; it was their lack of education. The peasant farmhands, serfs and slaves of the agricultural ages hardly had a happy lot – they too were living in crass ignorance, oppressed by landlords and brainwashed by their churches. Chomsky writes: “that division of labor will destroy human beings and turn people into creatures as stupid and ignorant as it is possible for a human being to be. And therefore in any civilized society the government is going to have to take some measures to prevent division of labor from proceeding to its limits.” That is wrong or badly expressed. 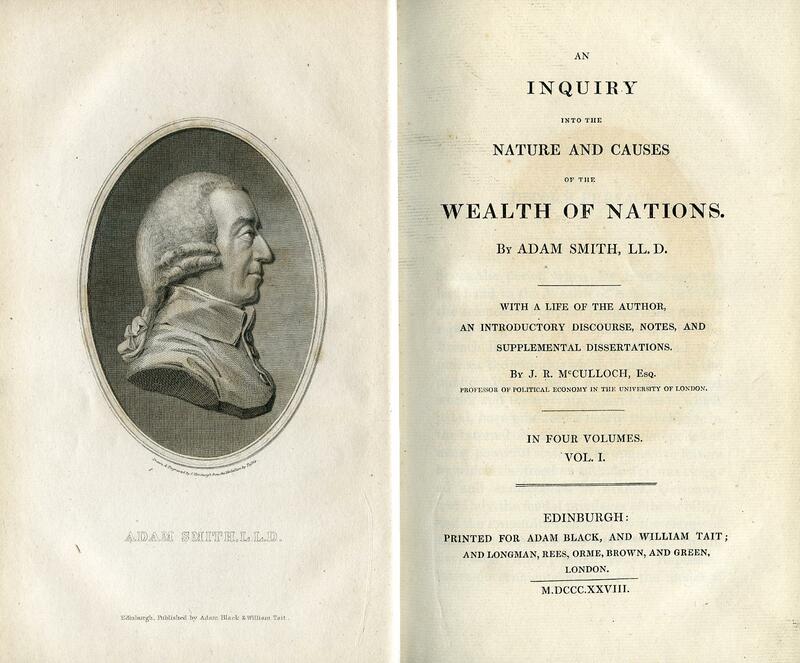 Smith’s theme in Book V of Wealth Of Nations on the division of labour was addressed to his readers, mainly legislators and those who influence them, of the necessity of introducing into England, mainly schooling for children of the labouring poor on the model of the existing education system in Scotland of ‘little schools’ in each parish for all children from 6 years to be taught the rudiments of reading, writing, and arithmetic, to avert in some measure the widespread illiteracy and innumeracy, and crass ignorance that was common among those children who went to work (often from 8 years, or younger) without such elementary education and who, as adults, were dangerous to public order, if misled by demagogues, religious or political. Smith played-up the fears of these consequences to win the political class (mostly the rich) for this reform. Chomsky misstates Smith’s intentions as being about preventing the “division of labor from proceeding to its limits”. Au contraire; Smith saw the division of labour as the key to the real improvement in living standards brought about by commercial society by its unlimited extention (for example, in the production of a “day-labourer’s woollen coat” (book I, p 22). Hence, his comparison, of the relative poverty of the labouring poor in Britain compared to the absolute poverty of even an “Africa king, the absolute master of the lives and liberties of ten thousand naked savages’ (p 24). Lastly, I am not known as a defender of either “neoliberalism”, nor “neoclassical economics”, nor for that matter ‘left’ or ‘right’ ideologies. My apologies, Gavin, if I attributed to you political views you do not hold. I was merely responding to our previous exchange on the topic of Adam Smith. I do think you underestimate the effects of the division of labor—in Smith’s writings and in general. Smith did, in my view, understand the stultifying effects on workers of the division of labor in capitalist factories. But, as you correctly note, he wasn’t willing to give up the division of labor, since it was key to the growth in the productivity of labor and, thus, in the wealth of nations. So, he proposed something else—public education—as an attempt to ameliorate the negative effects of the division of labor. Now, we don’t even make that pretense: education (whether public or private) should be vocational education, in order to train more skilled workers for the existing division of labor. We have, indeed, backtracked from the enlightened views of Smith. I am glad we have sorted that out. Many people misread Smith on the division of labour and the education of future labourers. Britain did not sort the gap in education until the 1870 education act. But Scotland also developed a different approach to the rest of the UK in developing the first ‘mechanics and arts’ schools movement, independent of government, for example, in my own former institution which started in 1821 as a one such school, which eventually become Heriot-Watt College in the late 19th century, and Heriot-Watt University University in 1967. These schools trained mechanics, tradesmen and technicians in maths, physics, chemistry engineering and such like, part-time and evenings in Chamber Street, opposite the University of Edinburgh’s grand main buildings, with many of the tutors and professors of the University conducting the classes. It took sometime before England followed Scotland’s lead. This what I mean by the power of ‘bottom up’ innovation over many of the ‘top down’ attempts to impose ‘one-size’ fits all.